What makes you great at copywriting? Mantras by John Bevins. What makes you great at copywriting? A touch of David Abbott. The first two quotes are by David Abbott’s copywriting contemporaries and equals, Robin Wight, and Alfredo Marcantonio. The third is by Abbott’s agency partner Peter Mead (Abbott Mead Vickers BBDO). Although there have been many quotable praises for David Abbott since his death earlier this year, I chose these three because they tell you something of the secret of great copywriting. Something you can take with you when you go back to your own writing. But first a few somethings about the man. Although I never met him, David Abbott made a lasting impression on my own copywriting as a young gun in the 80s and a Creative Director in the 90s. This impression has grown stronger than ever as I face the challenges of writing for a wired audience, where reading has all but been replaced by scanning. As you know, our greatest challenge is to write copy that is read not scanned. But if you apply a touch of David Abbott, there’s every chance you too will slow the eye motion to a read. Why does his choice of words and conversational sentence structures entice you throughout a story? Because they speak to you as if he himself was sitting across the table from you; so real, immediate and personally engaging is his copy. It is rewarding just to read it. 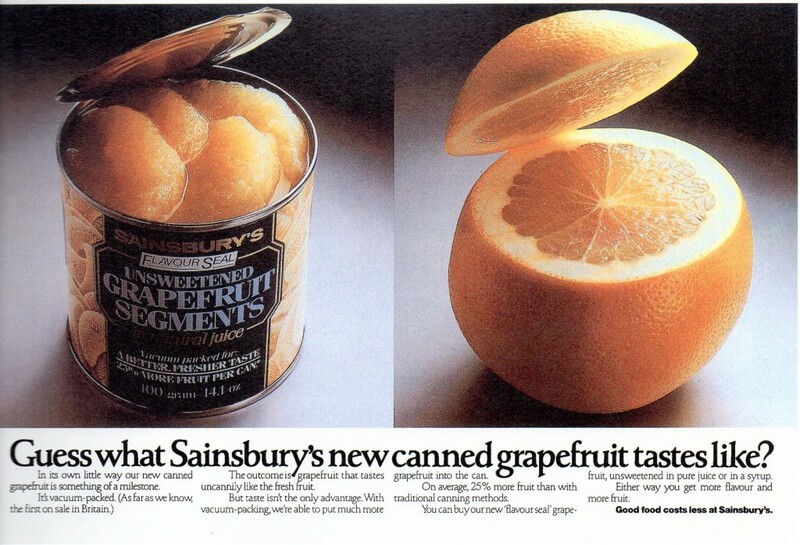 In his hands, Sainsbury’s vacuum-packed canned grapefruit becomes one of life’s little miracles. His listing of features and benefits is like a letter to a friend. And his ending circles neatly back to the opening thought. You exit the story informed, but also with a warm feeling — the kind that leads to the buy-in. Little wonder his copy rings true. His words speak in the language of the target audience, and to their hearts and minds rather than their wallets and purses. It is as true now as it was back in the 80s and 90s that we only read something if it is interesting to us. This goes for ads too. And what we are most interested in is the meaningful, the valuable, the useful and the pleasurable. And Mr Abbott shows us how to do all four with empathy and a sprinkling of wit to woo. Subtlety. Obliqueness. Keen. Shrewd. Aware. Perceptive. Discerning. Sensitive. Discriminating. Penetrating. Wise. Clever. Intelligent. Skilful. Artful. Nuanced. Apply some of these touches in your writing and your copy will certainly lean toward greatness too. 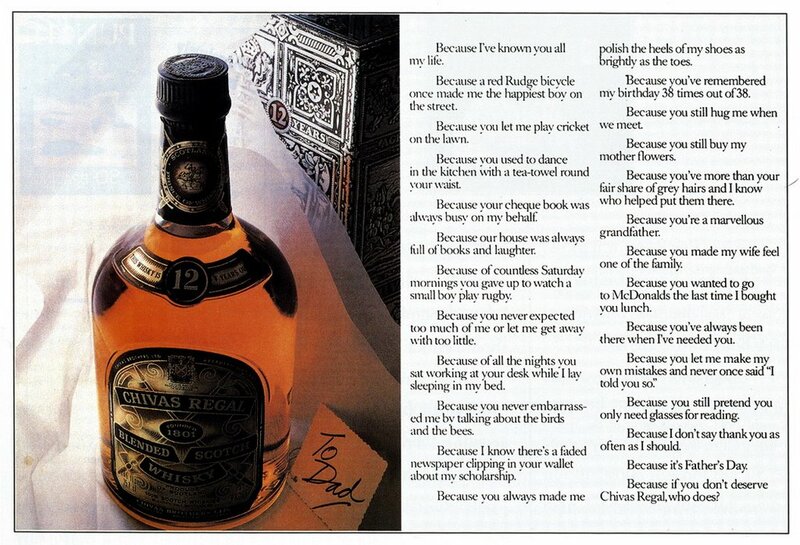 This famous Chivas Regal ad is a masterclass in writing from your own experience. As David Abbott said, ‘use your life to animate your copy. If something moves you, chances are, it will touch someone else too.’ It is a wonderful example of how you can write from the heart to the heart by pin-pointing and stating the simple truths. Notice also that their is no headline? You don’t need one. The rhetorical device of parallelism (repeating the same word or phrase) does a more poetic job than a listing headline like ’25 Reasons Why …’. I write with an Artline 200 Fine 0.4 Pentel – blue ink, never black. I generally work on A3 layout pads but will sometimes switch to an A4. Definitely low tech stuff. I write with my office door open – more often than not I keep my jacket on and in defiance of my mother’s instructions, my feet are usually on the table. Whatever size of layout pad, I write body copy in column widths. This habit goes back to my days on the VW account in the Sixties. I knew how many words to the line were needed and how many lines to the ad. Writing in columns made it easier to get the word count right. Alongside the column I jot down thoughts or phrases that come to mind before I need them. They stay there in the sidings until there’s a place for them. I also write down in the margins all the clichés and purple bits that clutter my head. I find that only by writing them down do I exorcise them. If I simply try to forget them they keep coming back like spots on a teenage chin. I rarely plan the shape of a piece of copy. By the time I come to write, the structure of the argument is somehow in my brain. I spend a lot of time fact-finding and I don’t start writing until I have too much to say. I don’t believe you can write fluent copy if you have to interrupt yourself with research. Dig first, them write. Like many copywriters, I read my copy out loud as I write. It helps me check the rhythm of the line and ultimately the flow of the whole piece. I often adopt the appropriate accent or tone, though my general “reading-copy” voice is laughably mid-Atlantic (I read silently if there are other people in the room). I am a fast writer and in a sense I am not interested in words. I don’t own a Thesaurus, I don’t do crosswords and my dictionary has pictures in it. Words, for me, are the servants of the argument and on the whole I like them to be plain, simple and familiar. I believe that I’m paid to be an advocate and though I get pleasure from the bon mot, the bon motivater thrills me more. Word-play is fine if it helps the cause but I use it sparingly, or not at all. This wasn’t always the case; I used to pun for England. When I’m working on concepts, I draw the shape of the ad space and write the headline (or scribble the picture) within its borders. It’s odd but I can’t judge an Economist headline until I’ve drawn a line around it. When I was younger I used big Pentels and large pads and swashbuckled my way to fertility. An ad a page. Now my would-be ads are much smaller and I might cover a page with six or seven thoughts – though sometimes when I’m stuck I go back to the big pad and the big pen. A change in procedure is often a good idea when you’re not getting one. I’ve been writing copy since 1960 and by now I’m comfortable with the job. I don’t panic and I know that the best thing for me to do when tired or thwarted is to walk away from the ad and do something else. The job still surprises me and for every easy problem, there’s a stubborn sister. I might rework a headline 50 or 60 times to get the thought and balance exactly right. If I think there’s an ad in there somewhere, I nag at it until it comes out. I’m often surprised how quickly time passes when I’m doing this. I look up and discover that I’ve been fiddling with the words for three hours. Agency life rarely allows for this level of concentration so I also write copy at home, late at night, or I’ll book a hotel room and work from there. (This piece, for example, is being written at the kitchen table.) I couldn’t work in an open-plan creative department, but I’m sure there are brilliant copywriters who do. Great copy has been written in cafés, on trains, on beaches, on planes, in cars – even occasionally at a desk. How you do it is less important that what you do. 1. Put yourself into your work. Use your life to animate your copy. If something moves you, chances are, it will touch someone else, too. 2. Think visually. Ask someone to describe a spiral staircase and they’ll use their hands as well as words. Sometimes the best copy is no copy. 3. If you believe that facts persuade (I do), you’d better learn how to write a list so it doesn’t read like a list. 4. Confession is good for the soul and for copy, too. Bill Bernbach used to say “a small admission gains a large acceptance”. I still think he was right. 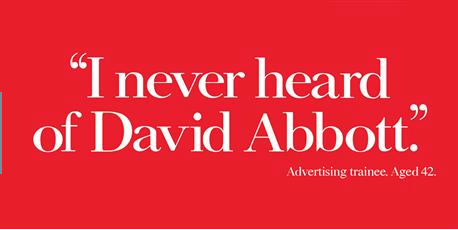 David Abbott’s ‘Management trainee’ poster for The Economist has been recreated in honour of his impact on the advertising industry by David Nobay, the creative chairman of Droga5 Sydney. A fitting tribute to a man who was so talented he made a lasting impression on people he’d never even met. 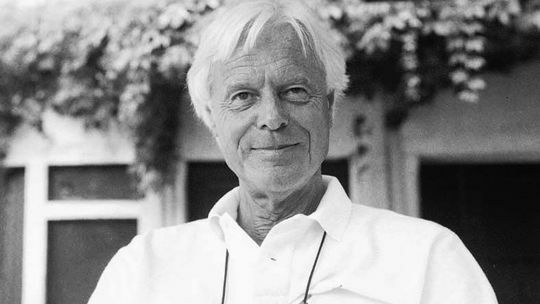 And stay tuned for the second in this series on great copywriters, next week it’s the remarkable John Bevins. What makes you great at copywriting? Dancing like Mary Wear. He does let the product do the talking. The examples of long copy and just a headline are very good. David Abbott has noted some important points to be mindful of when writing. You need time and practice, learning how to write a list without sounding like a list can prove to be difficult. and certainly an area I need to improve on in writing. You’ve described the process accurately Clara when you say ‘to be mindful when writing’. That pretty much sums up all the parts that make the whole.